Highland Stoneware was formed in 1974, by David Grant, while studying at the Royal College of Art in London. He is still very actively involved with the Company, and decorates many of the current designs. 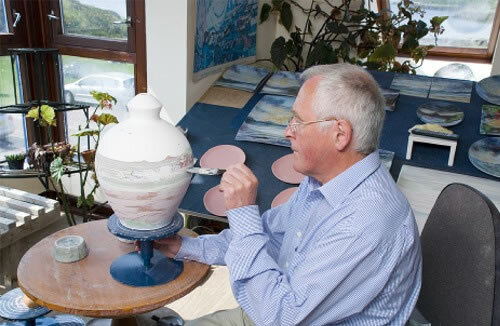 With support from his professor, David Queensberry and tutor Grahame Clarke, he set up to manufacture in the North West Highlands of Scotland, in order to make tableware with the quality of studio pottery, but also using semi-industrial techniques. This meant a return to the rugged landscape where he grew up, opening up opportunities for employment in a very fragile local economy. At present, 19 people work at our Lochinver pottery, and 5 at Ullapool. Initially, we made plain tableware, but very soon started to decorate the pots, and it is this individual variety of hand painting that we are now famous for. Our artists are encouraged to innovate and develop designs, and to make each pot different. Each piece is signed by the artist. For collectors, the book ‘Highland Stoneware’ by Malcolm Haslam, Richard Dennis Publications, provides an interesting history of the Company.